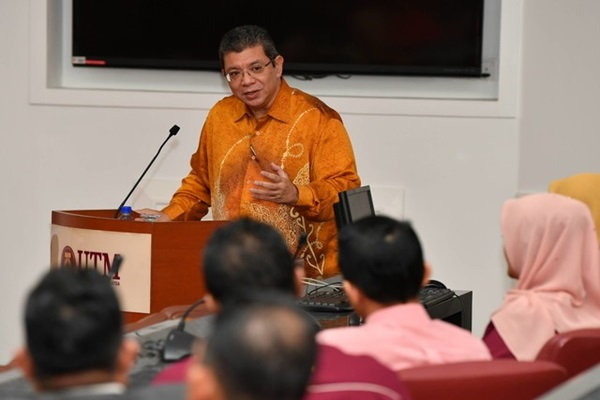 JOHOR BAHRU: Malaysia is hopeful that Singapore will agree to enter into negotiations on the second phase of the 1962 Water Agreement which involves the price modality, said Foreign Minister Datuk Saifuddin Abdullah. Stressing that the next phase would be a difficult one, he said Singapore is not refusing to discuss (the price modality) but will find it is something delicate to discuss. For us (Malaysia), we are now entering the second phase of negotiations where we should be discussing the price modality. To be fair to my colleague from Singapore, I think they have not changed position. I think they would find it difficult to accept that we are already into the second phase of negotiations, he told reporters after officiating at the International Seminar on Global Issues at Universiti Teknologi Malaysia, Skudai, here, today. And that is why there is a possibility that if the talks or negotiations cannot work, then we may have to go to the other stage, which is to go for international arbitration but arbitration means both sides have to agree, you cannot do arbitration unilaterally. So, I am very hopeful that even though this (water agreement) is a very delicate (issue), I am still hopeful that our Singaporean counterpart will agree that we should start talking about price but I know it is quite difficult for them, he said. “Both leaders agreed for the attorneys-general of both sides to discuss these differing positions. Both sides will seek amicable solutions, including the possibility of dispute resolution through arbitration on a mutually-agreed basis,” said the statement. Malaysia hopeful of second-phase negotiations on water with Singapore Borneo Post Online.